We don't usually get much hurricane activity up this way. Maybe some residual rain and win, but nothing too serious. In fact the last one I remember was Hurricane Gloria from way back in the early 80's. I think I was about 5 and we were living in Yonkers, NY with my grandparents. I remember sitting by the window and watching as the hurricane winds were bending birch trees over till their tops practically touched the ground. 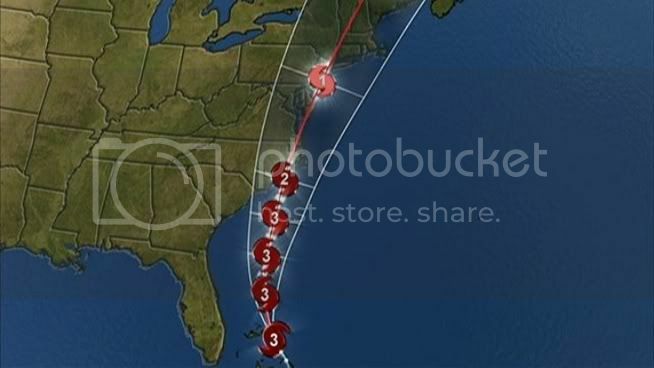 Well apparently Hurricane Irene is heading straight for Connecticut this weekend and is due to hit us on Sunday. The path right now shows the eye of the storm passing right through our area. What fun! During the winters when big snow stores are on the way, I laugh at the people flocking to the stores for bread and water. Yet tomorrow I will be one of those people. It is better to be prepared, right? I have to bring the boys to school for the open house after lunch, but then we will have to hit Stop & Shop for some basics. Goody, out shopping with four kids for the second time this week. Can you tell how much I am looking forward to that? According to Facebook chatter from local friends, the stores are already wiped out. I anticipate it will be insane there and I may not even get what I need. Though I bet the organic bread is probably the last to go, so maybe I have a chance? We will see. The worst part is that if there is a lot of damage or power outages this could affect the first day of school on Monday, Which is disappointing for me because I have been counting down till the first day of school ever since the last day of school. Are you in Irene's path? What are you doing to prepare? Any tips for this hurricane rookie? Stay safe, and post again to let everyone know you're okay! We just moved from Florida last month, so I understand your concern. Make sure you get gas in your car because if you have to evacuate, gas stations will be closed. I'm sure you know all the supplies you need. Stay safe. Saying my prayers for everyone in the path. Thankfully Irene stayed away from us in South Florida. Stay safe! We've been preparing for the hurricane all day. I'm a rookie too so I feel so unprepared! We stocked up on food, water, and gas... I'm getting all the laundry and dishes done and we have a cooler... And we're charging our cell phones. Oh and we put all the lawn furniture and everything in the garage. Am I forgetting anything?! Hahah I guess I'll soon find out, it's supposed to hit us here in Maryland in just a few hours. We were in the path, but we're ok…homes near us are a mess.